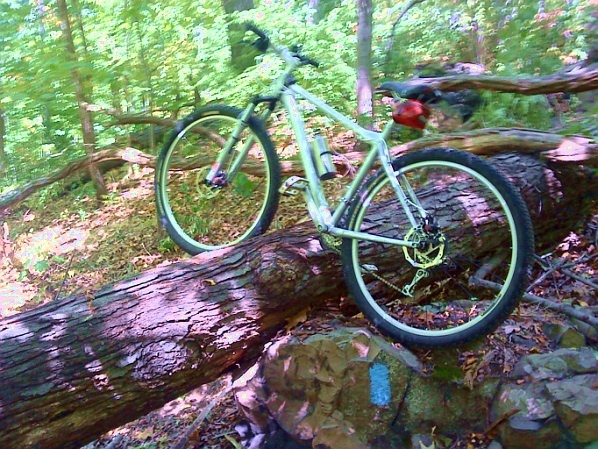 The Pocumtuck Ridge Trail area is great for mountain biking. If you like rolling doubletrack, we have that. If you like rooty, rocky downhill, we have that. There have even been races. Not every bit of the trail itself is rideable, but much of it is. Plus, there are great side trails and woods roads galore for riding and exploring. Very nice detailed coverage of the Highland Park and Rocky Mountain Park zone. Includes map. This guide can be a bit hard to follow, but has lots of good detail. "...If you missed the Sachem's Head Platform lookout before, take the second of these trails. Should you succeed in making the climb on the trail, you'll need to carry the bike and hoof it up the last 40 ft of steep rocky embankment to get to the lookout..."
"...serves up numerous short rides or one rather epic long one -- to suit all tastes ... Nothing truly technical, but plenty of rugged, dogged ups and downs..."